As you have noted, Immigration issues remain front and center in our national arena. The comings and goings of #45 with regard to what he is absolutely going to do, and then not do now, or not do for a year, or whichever way he changes his mind, makes it virtually impossible to know how to be proactive on these issues. I can only recommend that you continue to be constantly informed and defend, with your calls, texts, tweets, etc., the rights of asylum seekers, immigrant families (at the border and in our midsts), and of individuals who may just be more recent arrivals than we are, but are as much American as any of us. Incessant support, asking our leaders that we show a bit of humanity towards our fellow beings, is a must for all of us. Also, be advised that weekly Immigration Team reports (well, actually, no PI Team reports) do not/not appear in the PI nor the P&R Monday newsletters but can be found in the Prescott Indivisible webpage under News. Look for them there. And, if you miss a PI Grl Mtg, go to the PI YouTube channel and check out the summary videos. We have a lot to share re what is coming up in our area, and what we want to move towards, so please attend the NEXT TEAM MEETING: Tue, 16 April 2019, 4-530pm at Gateway Mall Foodcourt (have identified a quieter corner). In the meantime, please note the announcements attached. Spread the word re this event, whichever way you can, AND consider attending to hear how the PVPD is supporting our Latino community. Look forward to seeing many at the meeting NEXT TUESDAY. National – You have all seen it, heard it: #45 continues with his threats and, in the height of imbecility, is proposing BOTH to “close” the border and to cut off aid to the countries where the “caravan” families come from…. Mr T: Go back to Econ 101 and International Relations 101!!! There you would have learned that closing the border can affect the US economy severely, especially in the border states. And, cutting off aid to the countries where people are fleeing, not only due to gang violence but also because they cannot eke out a living, is counter productive. Bullying our countrymen is bad enough, bullying duly elected officials of sovereign countries is beyond the pale. Phoenix – The proposal to establish a third tier for higher education fees to bring down costs for Dreamers is stalled. This, while they continue to debate legislation for problems that don’t exist. On any and all of these key issues, please keep you eye on the ball and your fingers on your Twitter. Let them know we are determined to change DC and AZ – with every breath we take. BILLS URGENTLY NEEDING YOU TO CALL YOUR LAWMAKERS TODAY! SCR1014. AGAINST. Ask your Senator to vote against SCR1014, a resolution that would ask the U.S. Congress to hold an Article V Constitutional Convention on term limits. Apart from the debatable merits of imposing term limits, Justice Scalia warned there is no way to limit such a convention to its stated intent, leading to the danger of a “runaway convention” that would change the Constitution in unknown ways. SB1060. FOR. SB1060 is a good striker bill that would prohibit vaping in many public places by amending the Smoke-Free Arizona Act, protecting the public against “secondhand vaping” pollutants that have been linked to disease. Call Rep. Nancy Barto, Chair of the House Health and Human Services Committee, at 602-926-5766 and ask her to put SB1060 on her Friday committee agenda to protect public health. More bills on the floor this week are in the attached publication, Stand Indivisible! AZ Legislative Flash Bulletin, Vol. 8. Take special note of this one – HB2616. AGAINST. Stark voter suppression. Would make it a crime for anyone to receive compensation (even lunch, a bottle of water, etc.) for registering people to vote, including leading voter registration organizations as well as DMV employees and County Recorder employees where registration takes place, even library and health workers who register people as part of their community work. Four month jail term for failing to send in voter registration form within 10 days. Failed in House on March 11, passed on a motion to reconsider, now will be heard in Senate Judiciary Committee on March 28. Read about a high school government teacher who was fined $1,000 under a Florida law similar to HB2616. The Human Rights Team is doing a postcard action. We’re writing postcards to McSally and Sinema. They both need to know that we are watching, we’re not going anywhere, and what we expect from them. We will write as many postcards as possible to both senators between now and the next PI general meeting. I will collect them there and then photograph them (for social media) and mail them. I have the stamps. We should focus our message on kids being kidnapped and put in cages at the border. This is an immigration issue, but it’s also a human rights issue. In my opinion there should be Nuremberg style trials on this issue once everything is said and done. McSally and Sinema need to know that we expect them to take action to stop this horrendous practice. Use your own words, and please sign them from Prescott Indivisible or Prescott Indivisible Human Rights Team. Use your name too if you’d like. That’s up to you. Please write as many as you’re able prior to the PI general meeting on 4/5. I will collect them then and stamp them and address them. If you want to address them, feel free but please use McSally’s Tucson address and Sinema’s Phoenix address. I’m calling to condemn the continued detention of thousands of migrant children nationwide, particularly in unregulated “temporary” shelters like the site in Homestead, Florida. I expect [REP/SEN NAME] to call for the closure of facilities like Homestead and demand that unaccompanied minors seeking asylum be allowed to live with family or other sponsors without fear for their safety. I’m calling to demand that [REP/SEN NAME] oppose any effort to allow for indefinite detention or separation of migrant families. Alternative methods, such as the Family Case Management Program, have already proven successful and cost effective. Congress must work to fund and implement these methods instead of inhumane detention or separation of children and families. IF LEAVING VOICEMAIL: Please leave full address to ensure call is tallied. Send an email to our reps and ask that they vote NO on two bills: 2523 and 1451. Both harm education because of their intent. 2523 lowers the minimum wage for young workers between the ages of 18 and 22 years that was approved by the voters. Depriving students of their minimum wage rights when they are struggling to stay in college is discriminatory and discourages them from finishing their education. 1451 makes citizen initiatives (similar to Prop 305 or Outlaw Dirty Money) almost impossible to get on the ballot. And if you can attend the hearing on 2523 on Tuesday the 19th starting at 2 pm, head for the State Capitol in Phoenix for the House Elections Committee meeting. We need all hands on deck to defend democracy! FIRST OF ALL— Get registered on the RTS system. And start chiming in. This is really, really very easy. So stop putting it off and get on it. SECOND OF ALL– Go to the Iyer Report and read the actions. There are a lot of extremely important bills for you to jump in on. The ones I have listed are ONLY elections focused. Scheduled for a final House floor vote, Monday. OPPOSE. HB2039, sponsored by Kelly Townsend (R-16), would require county recorders to report how many people registered to vote using the federal voter registration form only, and, after each general election, to post the number of ballots those people cast. Arizona’s voter registration law is stricter than federal law, requiring voters to prove citizenship when they register — but the commonly used federal form doesn’t, and the US Supreme Court ruled in 2013 that Arizona can’t reject those federal forms. Many conservatives dislike federal-only voting, viewing it as potentially allowing non-citizens to vote; however, few voters cast a federal-only ballot, and cases of non-citizens voting are extremely rare. Scheduled for House COW floor debate, Monday. OPPOSE. HB2616, sponsored by Kelly Townsend (R-16), would make it illegal for anyone to receive money or other compensation for registering people to vote. This would include not only some of Arizona’s leading voter registration organizations, but DMV employees where voting registration takes place, people who work for the County Recorder, even librarians and health workers who register people to vote as a piece of their overall work in the community. It would even prohibit giving volunteers who register voters anything of value – lunch, gas, a bottle of water, etc. Townsend has promised an amendment that mimics language already in statute, barring circulators for initiatives and referenda from being paid per signature, and instead allowing them to be paid hourly. SB1072, sponsored by Michelle Ugenti-Rita (R-23), would impose photo ID requirements on voters who cast ballots at voting centers instead of their specific polling place. Voter ID laws are a common voter-suppression tactic, particularly against those who tend to vote Democratic: they not only prevent some who show up at the polls from voting, but also deter others from showing up at all. As the Washington Post notes, “Getting a photo ID so you can vote is easy, unless you’re poor, black, Latino or elderly… A lot of them just give up.” Studies agree that voter impersonation fraud is a myth, meaning there’s no good reason for these laws. Scheduled for House Rules, Monday. OPPOSE. SB1090, sponsored by Michelle Ugenti-Rita (R-23), would drastically limit voter access to emergency voting centers. Voters would be required to sign an affidavit, under penalty of perjury, describing their “unavoidable” emergency and stating that the person would otherwise be unable to vote in the election in any other manner. Maricopa County expanded emergency voting last year, opening four centers for the August primary election and five for November’s general election. The Arizona Republican Party alleges that this constitutes misuse of emergency early voting. Voters’-rights groups are calling the bill an effort at voter suppression. Passed the Senate with only Heather Carter (R-15) breaking from her caucus to vote No. Scheduled for House Elections, Tuesday. OPPOSE. Issues, legislation, discussions related to immigration continue on the front burner both in Phoenix and in Washington. It is hard to keep abreast of what to support and what to oppose. Locally, follow great reporting in the Arizona Republic via their website, AZCentral. And, to influence all state legislation, sign up for RTS and flood our so-called representatives with your opinion. At the national level, find the source that you consider least biased and inform yourself, act, and talk to your friends and neighbors asking them to do the same. In 2019 we must show our legislators that we have a voice that is loud and clear. We are not going away. We are in it to win and take our country, our state and our cities back! If you want to join a dynamic PI team, come to the next Immigration Team meeting on Tuesday, 19 March, 4-530pm at the Gateway Mall Foodcourt. Join us as we continue to forge working relationships with Keep Prescott Together and its immigration law clinics, as well as with faith-based organizations in the Quad City area and in The Valley which bring love and humanity to immigrants being “discarded” by ICE at bus stations and elsewhere. Both our Phoenix legislators and our CD4 “representative” in DC have been busy addressing immigration issues during the last week. As you read the pieces in the links below, it should be clear who and what we can/should support. But, to clarify some of the language bantered about: “Dreamers” protected by DACA do have, in fact, a Lawful Immigration Status; asylum seekers are, by definition and accepted international law, not/not entering a country illegally. And, to highlight the height of irony – our illustrious Dr? Gosar is big into having no/no federal interference in how states – even districts or cattlemen – conduct their business YET he is the first to introduce just those kinds of measures in the House. The following links are just very, very interesting reads, further highlighting some of the complicated issues around immigration, how immigrants are frequently misrepresented, and how even the young are trying to protect our democracy and see the inanity of The Wall. This last link is for fun (or horror) and most certainly worth the click and the read: a Brit’s look at #45. Enjoy. · make it illegal for someone to register voters as part of their job (HB2616). Thanks to all team members for their good humor, incredible work ethic and flexibility when asked to take on new assignments. 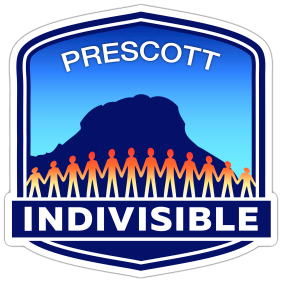 The team works with a professionalism that is a major reason why the efforts of Prescott Indivisible are outstanding. Designed and distributed PI rackcards and other printed materials.